Opis ebooka Overcome Shyness - Tiziana M.
When we think of someone being shy, we may think of a child who is hiding behind theleg of her mother because she fears strangers. 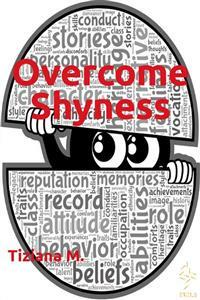 Shyness was once considered to be anasset for little girls as well as women because it was associated with modesty. I canremember my daughter hiding behind my leg when she was a little girl and thinking thatit was so cute. I never saw shyness as an impediment and, like many other adults, foundthis type of behavior very “cute.”Shyness is not cute. To the contrary, it can cause you all sorts of problems in life. Peoplewho are shy are usually unable to express their feelings and have a much more difficulttime when it comes to building relationships. My daughter, for example, found itdifficult to make friends as she got older and to talk to strangers at parties. While peoplefound her to be cute as a child as she hid behind my leg, they found her to be aloof andunfriendly as she blossomed into adulthood. Opinie o ebooku Overcome Shyness - Tiziana M.
Fragment ebooka Overcome Shyness - Tiziana M.
Chapter 1 - Why Are We Shy? unfriendly as she blossomed into adulthood. stomach when I have to meet new people or exert myself in social situations. background than call attention to themselves. think that it is cute for little girls to be shy - that it somehow makes them more ladylike. they do with their sons. care of themselves in the world and develop somewhat of a low sense of self worth. rejected once before they develop a low sense of self worth and an inferiority complex. Others can take a lot of rejection before it starts to affect them negatively.